It is a pump that removes water collected in a sump basin usually in the basement or crawl space of a home. Basements that are particularly wet or below the water table level need a sump pump. Its job is to remedy the wetness and help with basement flooding. It will remove the water from the home and far enough away from the building that it won’t cause any more problems. Usually the water is guided to a sewage drain or dry well. Sump pumps and sump basins are usually installed into the main design of the home where there tends to be water accumulation. There are two types of sump pumps- pedestal and submersible. The pedestal is mounted on top of the sump while the submersible is inside of it. There are two categories of submersible sump pumps- manually-operated and automatically operated. A manual pump will start pumping once it is connected to power. An automatic pump has a convenient switch that can detect water level and turn on only when needed. Dual-modes are also available making it easy to use the pump when needed but also capable of being left on for automatic use. Sump pumps should be examined at least once a year. Pumps that run more frequently with a higher water table should be check more often. It is important to maintain your pump because costly repairs could result if it were to fail. Secondary back up pumps can be helpful in this type of situation. PexUnivers.com has great sump pump reviews. 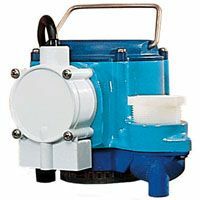 They carry a wide selection of sump pumps including many different models and outlet connections.